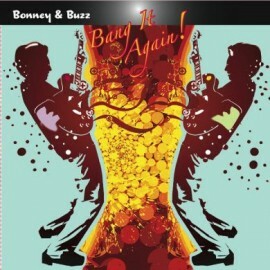 Bonney & Buzz are back with their second CD for Double Crown - a 17 track classic called Bang It Again! The duo features Bill Bonney of The Fentones ("The Mexican" and "The Breeze & I") and Pete "Buzz" Miller("Can Can 62" and "Totem Pole"), who was also half of the popular Shig & Buzzduo. They are joined by a bunch of accomplished musicians on drums, bass and percussion. You'll find seventeen surf / Euro-instro classics, including "Raunchy", "F.B.I", "Last Date", "The Breeze & I" and more!